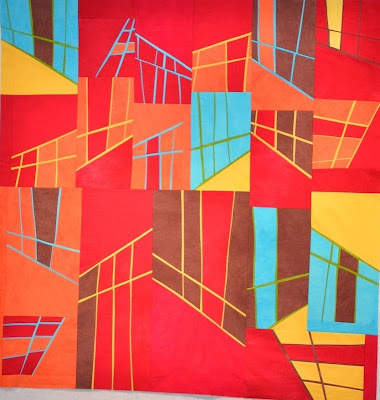 Just wanted to shout out about the wonderful Elizabeth Brandt who had a piece at .Fiber Art International 2013. Congrats Elizabeth for making it in to this prestigious event. I can’t wait to hear about the opening. 1. I am about 75 percent done on my large piece that I am free motion quilting. It is getting easier although I still bribe myself to work on it. I guess that’s why they call it work. 2. I took an online class at the beginning of the year called “Setting Goals” given by Lisa Call. It was a great class and I haven’t taken the time to blog about it. One of my goals was to blog more consistently and I am finding , that if I don’t meet the mark on a goal , I just feel more and more guilty so I do nothing about it. Oops-time to correct that. Upcoming post on that class this week. 3. Because of that class, I have had my head down working on a piece for the upcoming Artprize exhibition in September. It is where it needs to be to apply , but not yet quilted. Again, I’ll share once I get my artist profile up. 4. The house in Vermont has not sold so at this point, we will go there this summer with the kids. I will wait and do the majority of the fabric dyeing there. 5. Historic flooding here in Grand Rapids. I am going to try to take pictures tomorrow when it peaks. 6. 3 kids graduating in May: 8th grade, high school and college. This entry was posted in Elizabeth Brandt, family, Lisa Call, workshops on April 21, 2013 by Colleen Kole. I finished uploading my last assignment for my class yesterday. I was actually finished with it earlier in the week but procrastinated on it I guess because I just wasn’t ready for it to be over with. I set a S-T-R-E-C-H goal for myself this time: I wanted to entirely finish the piece right down to the sleeve and label. I had a huge cloud following me around. It was the cloud of unfinished projects and I was building up this huge barrier inside my head that these pieces would not get done. Ok, enough of that so the stretch goal. The last assignment was to simplify or elaborate our design. I chose elaboration and …fell flat. I didn’t like how I overworked the motif. If I look at my motif which I tried to increase the complexity of it by adding more lines, it is just too much, too busy. If I cover up the lower strip on the right purple motif or “house”, I like it better. So next piece I make I will eliminate that angled strip and see if that helps. When I put it up on the wall to photograph it, I saw what was wrong with it and when I wrote my self critique, it no longer felt like a failed assignment but another learning experience. And I set up parameters for the next piece. I love the phrase”the next piece”. I know I learned many things but the “next piece ” gives you freedom to try new things and not be afraid to fail. I felt fantastic that I met my stretch goal for the week which was to finish the piece and have no anxiety about machine quilting the other pieces. It was truly a gift to take this class. I highly recommend Lisa Call as a teacher and the online experience was better than I thought possible. I am finished with class but just beginning to find joy in working in a series. 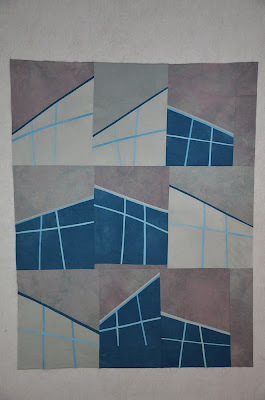 This entry was posted in Lisa Call, Rooflines series, working in a series, workshops on March 4, 2012 by Colleen Kole. This was my reference composition and I wanted to work off from this piece. I set my parameters for my assignment : change the thickness of the lines to less than 1/4 of an inch, use a color I don’t like (brown), add more colors within the motif, and try to vary the placement of the motif. This is done for the week. And I have never been so relieved. I finished assignment 4. One more lecture on Sunday night, and then one more assignment. I will really miss this class. 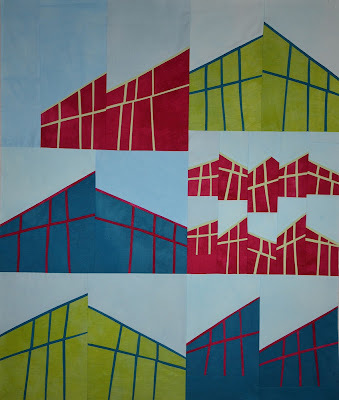 This entry was posted in Lisa Call, process of becoming an artist, Rooflines series, working in a series, workshops on February 22, 2012 by Colleen Kole. I looked at my last post date (after a prompt from a friend) and couldn’t believe I hadn’t posted in over a week. So, I return and will give you a quick update. Vacation: We returned home last Saturday to a houseful of furniture which needed to be moved back into place as we had our hardwood floors refinished while we were away.What a mess of dust to return to. And my college daughter was home on winter break and just left yesterday so I wanted to spend some time with her. It also just takes me a good 48 hours to transition and get back up and running smoothly. No matter how efficient I try to be! Vermont: Had a great vacation and I was a hermit working away and enjoying my time with family. I made cheese one day and will share tomorrow. Very fun. Very little snow but they did ski with lots of snow made by the snow guns. My class (Lisa Call Working in a Series): I am still in a lovefest with this class. I have had my moments of self doubt (why should I be taking this class? who do I think I am fitting in to this class? why in the world would I think this piece of fabric would work or this color? I don’t even like this piece so why would I show it to her, my classmates or you ? Why am I working so hard?) Ok maybe a few hours or a day or two of self doubt. But in the end, I just want to create and be more focused in my creativity. Working in a series is putting everything I have previously learned into a framework. Have I made anything exceptional? No, that isn’t the point. Learning how to move forward is and to create more work is. You work hard and I am learning to be patient with myself and my work. Well worth every minute of work and money I have spent on this class. I see glimpses of hope in each piece as I move forward-an area of each piece that I like and can improve upon. In the next piece. And the next piece is what I am working on! This entry was posted in Lisa Call, on being a studio artist, Rooflines series, working in a series, workshops on February 16, 2012 by Colleen Kole. I thought I would finally take some time and show you what I have been doing in Lisa Call’s class Working in a Series. I just needed a little breathing room to post on what I have been doing and realize that it may take me 10 or more pieces before I really find what I may want to work on in a series. The first week’s assignment is based on your original macquette which I posted previously. 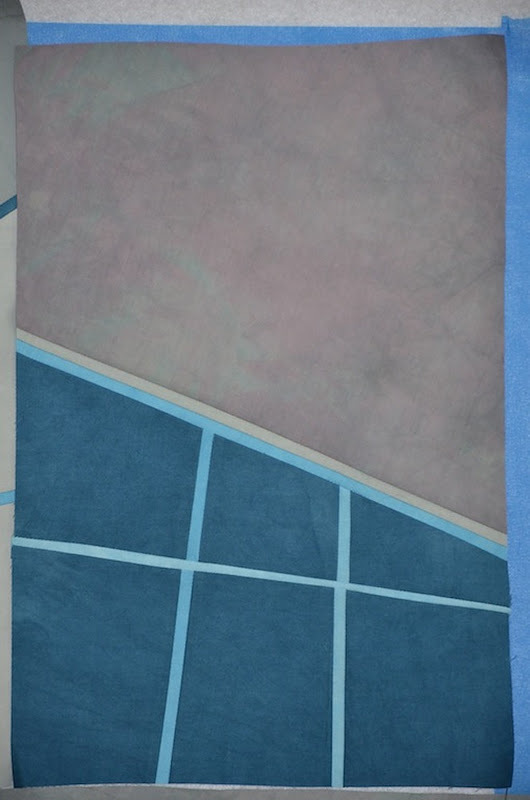 It was inspired by the rooflines of the local botanical garden. I chose a motif that I wanted to explore and my base design was created. The next week’s assignment focused on color and value. I thought I would be in trouble with all my bold and bright colors so after conferring with Lisa decided to change up my original design ( save this for more subtle colors I dye this summer) and use the fabric I have on a new design. I chose the assignment of using a color combination which I hadn’t used before-red and green. The proportions weren’t right with this piece and I feel the middle third needs to be re-done. I fell in love with the linework while doing this piece. And I am becoming less dyslexic with triangles. I got a little bolder and more comfortable and thought I would try to use my bold and brights on the original design. The second week’s assignment was on space and scale so I modified the size of some of the elements. Looking at how successful piece was as far as figure-ground composition was also part of the self critique. This piece turned out really large. I haven’t done a self critique yet on this piece. I photographed it on the barn as we are in Vermont on vacation this week and the sunlight on it is kind of odd. But this feels better and now I will go write down why. Needs improvement but that’s ok too. This class has it all: working at home at your own pace, a kick in the seat three times a week with informational e-mails, establishing a good studio practice, and learning how to actually work in a series. I feel it is finally giving me the tools to move forward. Finally. This entry was posted in Lisa Call, process of becoming an artist, Rooflines series, working in a series on February 6, 2012 by Colleen Kole. I am deep in week two of my online class given by Lisa Call. The past two weeks I have buried myself in reading information, thinking time, consistent journaling and actual work. 1. My Theme/Inspiration/Intention: Finding beauty in the architectural rooflines and windows of our local botanical garden, the Frederik Meijer Gardens. 2. 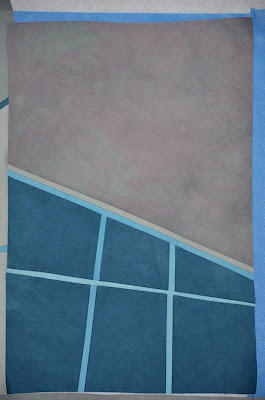 I wanted to use a motif incorporating and abstracting lines so this will be my motif. I set the parameters of working in a 3×3 foot size. 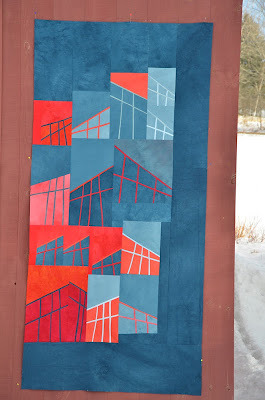 ( I have never set a specific size for myself and stuck with it: challenge #1) I did specify that I would not drive myself crazy and try to actually complete the machine quilting during this workshop. I haven’t worked with lines before so thought this would be another challenge for me. I loved the making of the lines and hope for them to evolve into a little bit softer lines. But as I have found this week, week two, you really have to be focused on your original intention for the series and shut the thousands of doors that you find when you start something new. That is the reason you come back to intention -which I fought , kicked and screamed about last week. I didn’t want to do it. Whew- I am pushing and pushing and loving putting all the pieces and parts together of what I had previously learned. Great stuff if you are thinking of taking Lisa’s workshop. 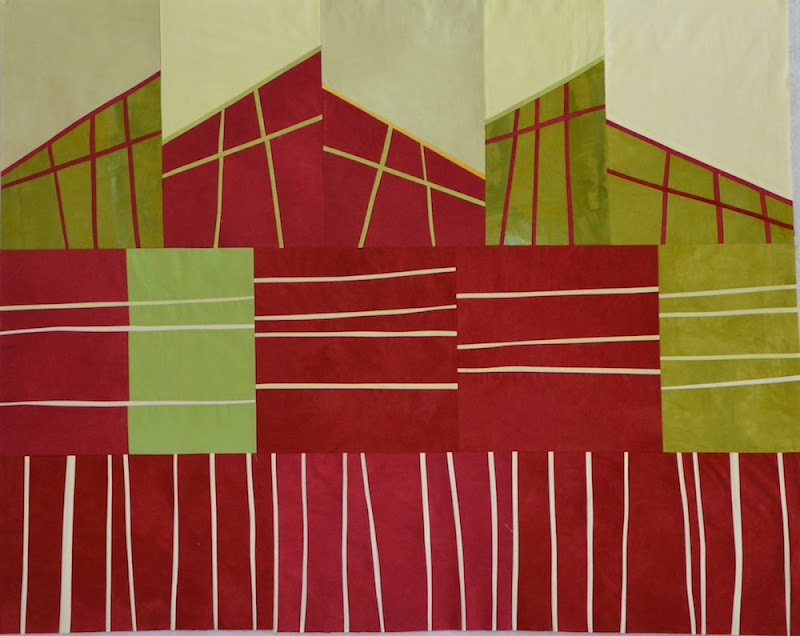 This entry was posted in Lisa Call, Rooflines series, working in a series, workshops on January 19, 2012 by Colleen Kole. I signed up for an 8 week online class with Lisa Call called “Working In A Series“. It actually was my Christmas present from my husband, Marc. Yes, a very sweet man who encouraged me to try it . Ok, I begged and he agreed for it to be my present. I really need nothing else. Well, there is no “trying it”. I am deep in the rabbit hole soaking it all up , pondering, making right brain meet left brain (ouch-very painful experience) , stomping occasionally having little fits and thinking things through in ways I never have before. Starting and starting again. The online format to me was questionable with an art class. But Lisa has methodically and meticulously set up a private blog forum for the class. We receive e-mails three times weekly with loads of reference material and can post questions on the blog as much as we would like. That is in addition to lectures via conference calls -five 90 minute lectures. The first one was Sunday night and we are off and running with potential ideas for a series. Assignments are given and due dates described with finished work posted on the private blog. I have to admit that I have not had intention, theme or meaning associated with my art. A whole new world is opening up for me. I am working hard and not ready to share yet. But I will. When I am ready. I am going to take my time with this one and try to push myself to understand working in a series. Right now, I am deep, deep in the rabbit hole doing the work. If you have an inclination to take her class, jump in. Soon. Lisa is a wonderful teacher. Week one assignment due Sunday. 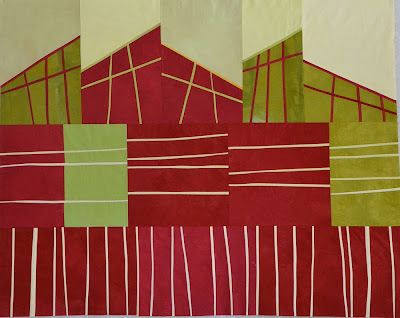 This entry was posted in Lisa Call, Rooflines series, workshops on January 13, 2012 by Colleen Kole.